I was heading up Broadway after a particularly unpleasant workout on the Santa Monica stairs. There was some sort of organized running thing going on, which messed up my drive home, and it was because of that detour that I came to notice Pono Burger. I assembled Happy Meal and The Marinater. The Marinater was able to take some time off from juggling manhole covers on Venice Beach to join us. 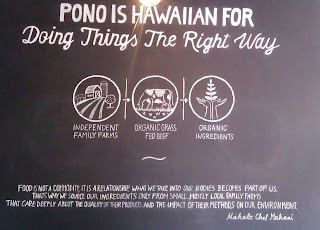 From the Pono Burger site, "...Chef Makani's philosophy is simple: use organic and farm fresh ingredients for a handcrafted burger made with integrity that above all, tastes great..." Pono means "doing things the right way." Pono Burger was the sister restaurant of Ultimate Burger in Kona, HI. 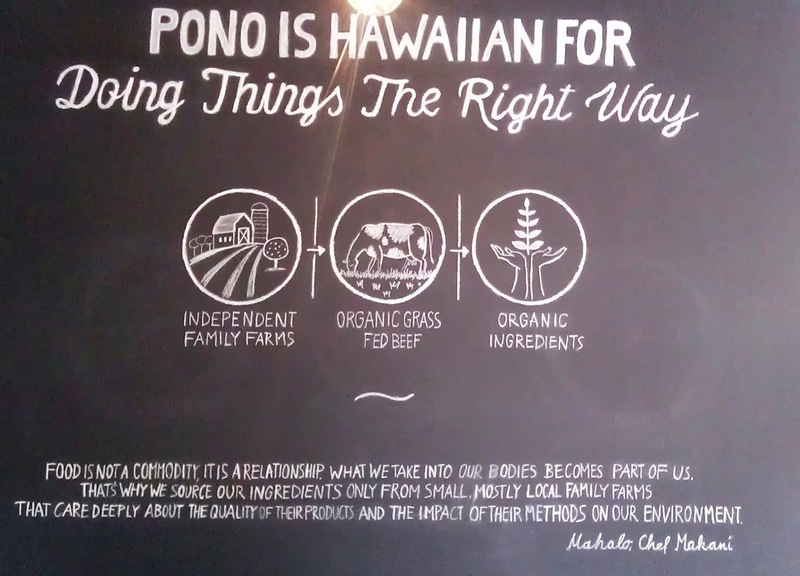 Pono Burger's thing was to serve high-quality ingredients with a minimum of fussing. We noted that the new kitchen was an immaculate an gleaming study in stainless steel. Now, if you visit the Pono Burger site, you will note that they tout free parking. We couldn't find it, but there was plenty of metered parking on the street. 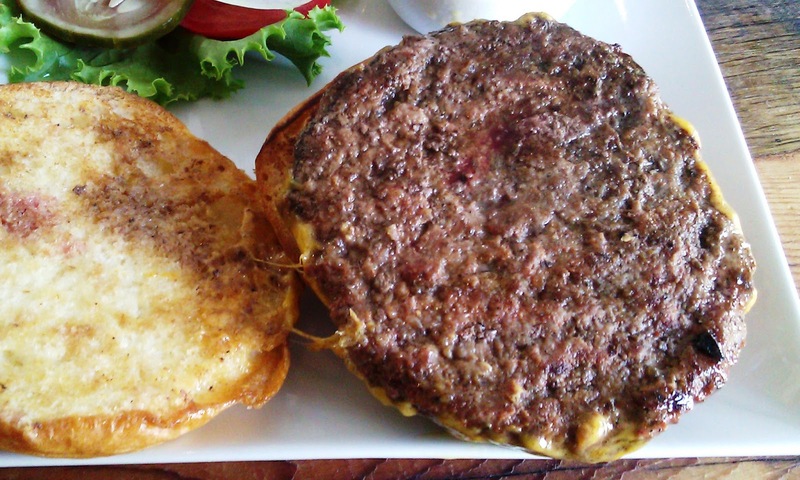 We ordered the $7.00 Pono Burgers and added the paper-thin slice of Hook's Cheddar for an extra buck. We waited about 10 minutes for our burgers to arrive. The Beef: This was the star of the show. The beef arrived pre-ground and pre-pattied from Hamilton Meats, and it was derived from cattle from SunFed Ranch. The beef was organic, grass-fed, and grass-finished. The cuts were a bit of a mystery to the staff. We got "Chuck" and "Premium" in terms of description. The burgers tasted of premium cuts. The flavor was strongly beefy, with generous amounts of iron from the blood, a mild bit of funk from some aging, and some complexity that may have been due to some Sirloin or Short Rib. The fat content was close to 25%. The mouth feel was firm and satisfying. The Seasoning: I watched the kitchen apply a copious amount of seasoning to the burger patties prior to placing them on the grill, but the savory notes were all but lost by the time the burgers arrived. The Sear: Meh. What sear? The wood-fired grill was way too cool to even get grill marks onto the 1/3 pound patties. A hearty sear would have really hit the spot with this burger. The Cheese: The Hook's One Year Aged Cheddar was great when sampled alone, but the slice was so thin that it was lost in the overly sweet bun. Without the bun, the cheese was still barely noticeable. This burger warranted a thicker slice of cheese. The Bun: The brioche at Pono Burger was a bespoke recipe, which was baked and delivered by Ragusa's Bakery (I couldn't find such an establishment, so perhaps I misunderstood.). The bun was cross between a brioche and a King's Hawaiian Roll. The bun by itself was fine. It was a little flaky, strongly sweet, pleasantly moist. However, it was the exact opposite of the burger and cheese. The bun was kryponite to the burger. The flavors of the bun utterly cancelled out the beef. It was nearly unsettling. I removed the top bun to diminish its beef-neutralizing effects. 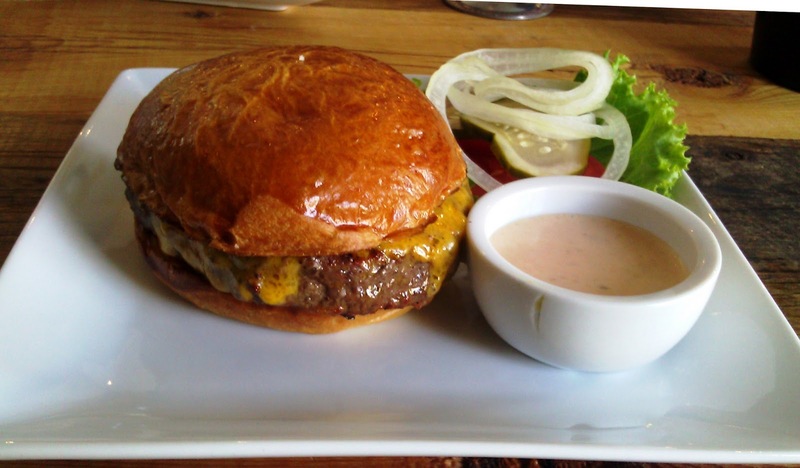 Again, the bun, on it's own, was fine, but it was poor match for the flavors of the burger and cheese. Beyond that, the bun was only slightly toasted--it provided no crunch. The Meat To Bun Ratio: Notwithstanding the foregoing, this was spot on. The Toppings: The Romaine lettuce and the tomato slice were clean, fresh, and ripe. 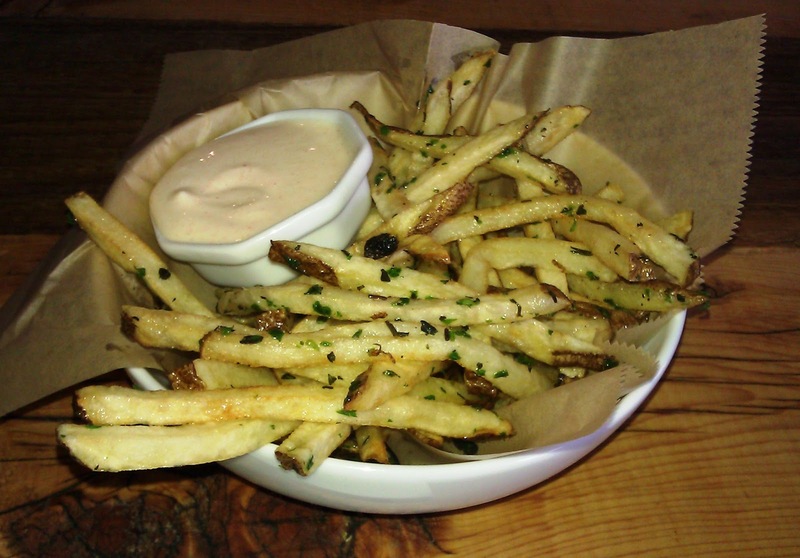 The Fries: The fries were peel-on, cut in-house, par-cooked, and fried in rice bran oil. They were seasoned with herbs--mostly thyme. The fries were properly crisped. The skimpy portion of fries went for 3 bucks. Spuds were cheap..there was no point in holding back on the fries. The Value: 8 bucks for a 1/3 pound cheeseburger was a little steep considering the stingy cheese, the lacking sear, and the flavor-zapping bun. The ingredients were great, but much tuning was required to deliver on the value. Pono Burger was only a few weeks old when I stopped in. I hoped that it would hit its stride and reach the potential of the ingredients. At the time of my visit the whole was far less than the sum of its parts. Burger Review : Great potential in terms on concept and ingredients. Hopefully the execution will catch up with the vision. Beyond that, it would be nice if the portioning caught up with the pricing.